*UK Offshore destinations are treated as overseas and additional charges may apply. This includes Isle of Wight, Isle of Man, Isles of Scilly, Channel Islands, Northern Ireland, Highlands and some areas of Scotland. If you are located in any of the following Highlands postcodes, then please select Highlands - AB30-38, AB44-56, FK17-99, G83, IV1-28, IV30-39, IV52-54, IV63, KW1-14, PA21-40, PH18-26, PH30-41, PH49-50. If you are located in any of the following Islands postcodes, then please select Highlands - HS1-9, IV40-51, IV55-56, KA27-28, KW15-17, PA20, PA41-49, PA60-78, PH42-44 and ZE1-3. Items marked as out of stock can still be ordered. Please email for details. Items marked with a stock availability date are out of stock but more stock is expected soon. You can still order these items, but there will be a delay on the shipping of the entire order. We will keep you informed as to the progress of your order. If you have any special requirements, please contact us before ordering and we will try to help. 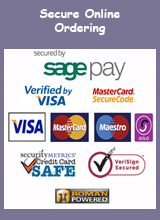 If you would prefer to give your credit or debit card details over the phone you can place your order by calling 01451 820425. Overseas Orders outside the European Union may be subject to additional customs charges or taxes on entry to the destination country. We do not allow for or estimate these costs. Customers will need to pay these additional charges to the appropriate authorities in the destination country. You are advised to check with the appropriate authorities to find out if charges apply before ordering. In the event that customs charges are not paid by the customer directly to the relevant authorities in the destination country, the charges may be returned to us and, if so, then we will charge them to the customer's credit or debit card. In this case there will be no appeal by the customer as customs charges are the responsibility of the customer and must be paid where due. Most parcels and Kits are sent by Interlink Express Next Day Courier Service (UK offshore destinations as listed above may take longer). Small items may be sent by Royal Mail Special or Recorded Delivery. We are happy to ship to a UK forwarding company but we are only responsible for the parcel until it reaches your forwarding company. We cannot entertain claims or queries of any kind about lost, damaged or missing items or any other difficulty relating to the order or delivery when it reaches the customer via a third party carrier. In the event that the goods do not meet with approval or expectation we will accept returned goods unused within seven days of receipt for a full refund less a ten per cent restocking fee or less the total postage, packing and handling costs of shipping the original order, whichever is the greater. Special Order items are not eligible for return or exchange. Overseas shipping costs are non refundable. All products are covered by a twelve month guarantee for material defects or manufacturing faults. Repair or replacement will be provided on return of the faulty goods. Please note that Bulbs are specifically excluded from our returns policy. Before returning goods please contact us for a returns code and wait for our reply before returning. We do not accept any return without our prior agreement and/or without a returns code. Please quote your returns code on the return parcel and in all correspondence. Please return goods to us in their original condition, unused and with all original packaging and labelling within seven days of receipt. We regret that we cannot accept returns after this time and we cannot accept returned goods that are marked, soiled or otherwise not in the condition in which they were originally supplied. In the event of goods being returned we will arrange for courier collection where requested or the customer may choose their own method of return. The customer is responsible for all return costs. We strongly recommend that you take out insurance to cover returned item/s in transit as we cannot be responsible for items that are damaged or go missing whatever returns method is used. If you are unsure about return methods or costs, particularly for damaged or incorrect items, please contact us for clarification and approval before returning items. Customers returning goods from outside the EU, please be sure to inform the carrier that the products are returns. We are unable to pay customs, taxes, duties or carriers fees for returned items. Please see our full Privacy and Cookies Policy, in accordance with General Data Protection Regulation (GDPR) that came into force on May 25th 2018. Placing an order with us, but whatever means, shall be deemed to be acceptance of and compliance with these Terms and Conditions. Terms and Conditions may be amended from time to time without notice.